Nestled between the Great Himalayas and the Kunlun mountain ranges, Ladakh is an epitome of Tibetan culture, monasteries, and stunning landscape. Also referred to as ‘Little Tibet’, Ladakh is the highest plateau of the Indian state Kashmir, and has much to offer right from the picturesque snow clad mountain peaks, rich cultural heritage to esoteric rock carvings. Unadulterated by modern-day iconoclasms, Ladakh strongly exemplifies the region’s ancient traditions. The former capital of the Himalayan kingdom of Ladakh, Leh was once an important stopover for traders wayfaring between India and China. The city is famous for its heritage villages, and the ruins of The Royal Palace & Fort. Things to see and do : Shanti Stupa, Leh Palace & Fort, the backpacker vibe at Changspa, day trips to neighboring monastic villages. When to go : June through late September. September is off season. Carry a good assortment of warm clothes. Even during summer, the temperature can drop significantly. Also, since the city is situated at an altitude of 3500 meters above sea level, you might experience a little discomfort and temporary altitude sickness. Situated in the upper parts of the Indus Valley, Shey is primarily famous for housing the Summer Palace of the kings of Ladakh. 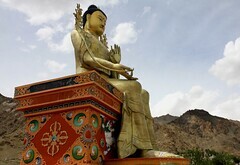 The Summer Palace, which was built over 555 years ago by the then king of Ladakh Lhachen Palgyigon, is also the home to the largest, gold-plated statue of Buddha in Ladakh. 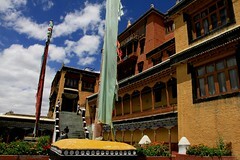 Things to see and do : Shey Monastery, Shey Palace, and Druk White Lotus School. Use Shey as a base to explore Thiksey & Hemis. A visit to the eco-concious Druk White Lotus School is highly recommended. It can be covered as quick detour between Shey and Thiksey. The school has guided tours for visitors. The most striking feature of the Thiskey monastery (the most and probably only integral part of the small town Thiskey) is its resemblance with the Potala Palace in the city of Lhasa, Tibet. The monastery is affiliated to the Gelugpa sect, and is a 12-storey high complex encompassing many traditional and contemporary artifacts and relics of Buddhism such as statues of Buddha, stupas, thangkas (a silk painting usually of a Buddhist deity), swords, and wall paintings. 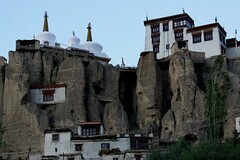 Things to see and do : Thiksey Monastery. Get to the monastery early in the morning before the day trippers arrive from Leh. The onsite gift shop is a great place to pickup high quality souvenirs. A small town to the southeast of Ladakh, Hemis is synonymous with the Hemis monastery. The largest and highly majestic monastery has a rich cultural heritage and is said to have been built in the 11th century. 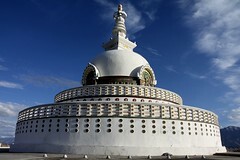 It was later reconstructed by King Sengge Namgyal. Things to see and do : Hemis Monastery, Hemis National Park, and Hemis Festival. The display of the ancient Thankas (paintings on silk) by the monastery is one of the most awaited events of the Hermis festival but it happens only once in 12 years. Other than that you can join in the dance and music that the festival is known for. Want to blend in with the vibrancy of the festival? Carry some colorful clothes with you or be ready to buy a few at the town itself. On the way to Srinagar from Leh, a small town featuring exotic ruins, Basgo was once considered to be an important historical and political centre in Ladakh. The city now is basically renowned for its monastery and various temples. Things to see and do : Basgo Gompa, Chamba temple and ruins. Although, Basgo is right off the highway, it is easy to miss since it blends in well with the mountains. Try the local, humble but delicious cuisine comprising mainly of barley, alfa-alfa and other leafy vegetables. 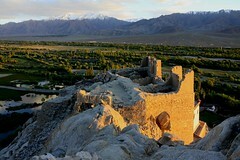 Known for its Klu-kkhyil monastery, the small town of Likir is perched on a little hill. The population of the town is dominated by the Gelugpa sect, and the town itself was once an important stopover for traders. 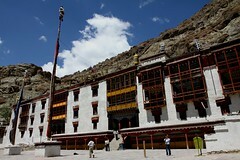 Things to see and do : Klu-kkhyil Gompa that has a 23 m tall statue of Maitreya. Likir has some spectacular trekking routes. While at the Likir monastery do not forget to pay special attention to the large, rare Jupiter tree in the courtyard. Another small town in Ladakh and a part of a conglomeration of villages, Alchi is located at the banks of the Indus River. The town houses the famous Alchi complex or group of temples, of which the Alchi Monastery is the oldest and most popular. The distinction between the Alchi complex and other monasteries in Ladakh is that the Alchi complex is situated at a lower altitude. Things to see and do : The Alchi complex is a beautiful amalgamation of temples. Alchi is a nice place to break your journey from Lamayuru to Leh. Public transportations is very limited in these parts. One can always hitch rides along this route. Legend has it that centuries ago, the present day Lamayuru region was a lake-filled valley, which was magically dried up by renowned Buddhist yogi Mahasiddha Naropa. Later, the valley was covered in rocks and Mahasiddha Naropa then went on to establish the Lamayuru monastery. Lamayuru Gompa is one of the largest monasteries in Ladakh and is home to 150 plus monks. Senge-sgang temple is the oldest surviving monument in Lamayuru, and has been attributed to Rinchen Zanpo. Don’t miss the annual festivals, as Lamayuru hosts not one but 2 annual festivals replete with masked dance performances, music, vibrant colors, and special prayers. Lamayuru has a nostalgic old century feel, make sure to carry your camera around. The disputed lake of Pangong Tso is an epitome of natural beauty, and is about four to five hour’s drive from Leh. The region has seen an influx of tourists after the climax of the cult Bollywood movie ‘Three Idiots’ was shot near the Pangong Tso lake. The Pangong Tso lake is in the talks of being identified as a wetland of international importance under the Ramsar convention, and if granted, it will be the first trans-boundary South Asian wetland under the convention. Opt for camping near the Pangong Tso lake so that you can actually witness the chameleonic colors sunlight plays on the lake from dawn till dusk. Although there is no option of fishing, you will be able to see ducks and some crustaceans on the shore. DO NOT FORGET YOUR CAMERA! A prosaic point you might say, but this is one of the most, if not the most beautiful place in Ladakh and you can’t miss out on clicking some absolutely stunning pictures. Pay special attention to clothing and shoes. Wear something that you are comfortable in and can walk on the shore easily. Most tourists have described Tso Moriri as a piece of heaven on earth. 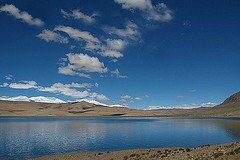 The breathtaking natural scenery, the beautiful rippling lake, and the magnificent roads etched amidst nature, is what makes Tso Moriri worth visiting. 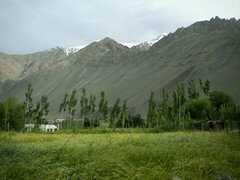 The valley of Rupshu that encompasses the lake. The wide and diverse fauna. From the black-necked cranes, Tibetan gazelle, Lynx, brown-headed gulls, bar-headed geese, snow leopards, and Tibetan wolf, there is an eclectic presence of fauna despite the lack of good vegetation. Increase in tourism has led to a rise in the threat to the flora and fauna of Tso Moriri. While conservation efforts are being made, as a tourist please exercise restraint and refrain from damaging/polluting the region. Jeep Safaris are a great option if you want a comprehensive view of the Tso Moriri’s flora and fauna. 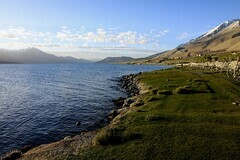 Close to Tso Moriri, Tso Kar is another lake in the periphery of the valley of Rupshu. The brackish lake is located off the road to Leh from Manali, and is fast becoming a tourist hub due to the variety of birds that visit the wetland. Yaks are common in the region. Some locals offer a yak ride to tourists as well. Salt dunes are commonly found along the shores of Tso Kar. If you interested in birds, you might want to extend your stay at Tso Kar, as the region is flocked by some of the rare and exquisite species. If you are a wildlife enthusiast, go for Kiang, Bharal (blue Himalayan sheep) and the Great Tibetan Sheep sighting. When to visit: During the summer season, April to June. Carry a pair of binoculars for bird watching. Book your tents in advance as due to the limited number of tents available, it can get difficult to find one on arrival. 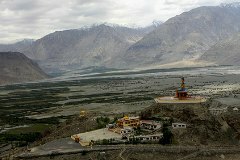 Initially named Ldumra or the valley of flowers, Nubra Valley is the second most popular tourist destination after Leh, in Ladakh. The valley can be accessed only through the Khardung La pass or tourists can transverse over Wari La from Sakti. The famous Siachen glacier lies to the north side of the valley and Nubra Valley is well connected with Xinjiang (China) through the Karakoram Pass. Diskit monastery along the Shyok River is a culturally rich monastery. Also, the village of Baigdandu that falls in the village of Diskit is known for its scenic beauty. 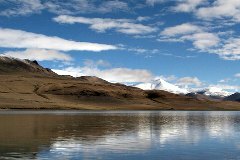 Yarab Tso, a holy lake located near Sumur village . The conglomeration of several villages near the valley. These include Tirith, Panamik, Sumur, Turtuk, Kyagara, and a few more. Of these, Panamik is renowned for its hot springs, and the monastery between Kygara and Sumur is another must-see. Non-locals need to obtain a pass at Leh for entry. The pass, although easily obtainable is a must. While at Nubra Valley, indulge in the local cuisine. The densely populated Zanskar valley is a part of the tri-armed valley system and is the most isolated of all the other Himalayan valleys. Nestled beautifully between two alpine lakes and snow-clad mountain peaks, Zanskar valley is the ideal trekking location in Ladakh. The Drang-Drung, a tributary of the Zanskar river, carries the largest glacier in Ladakh- the Drang-Drung glacier. The valley is highly irrigated and fertile. Consequently there is a lot of flora and fauna that tourists can explore. The most remarkable is the meadow covered with hundreds of edelweiss. Panzila pass is another main attraction. River rafting and trekking are quite popular. The monastery in Karsha is well-maintained and has some interesting relics. Also, the Karsha community is one of the most self-sufficient with proper schools and modern-day market facilities. When to go : During the summer, April to August. The valley is impregnable for 8 months due to heavy snowfall and Zanskar valley is open to tourists only during the summer season. You must carry comfortable warm clothing even during summer as the valley has irregular and fluctuating temperatures. You can either put up at hotels, or opt to stay in certain monasteries that provide accommodation.